Winter 18/19 Snow Goggle. Forest Bailey Signature with Dark Smoke + Lumalens Pink Ion Lens. Winter 18/19 Snow Goggle. Danny Davis Signature with Dark Smoke + Lumalens Rose Lens. Winter 18/19 Snow Goggle. Blake Paul Signature with Dark Smoke + Lumalens Rose Lens. West with Dark Smoke Blue + Yellow Blue Ion Lens. 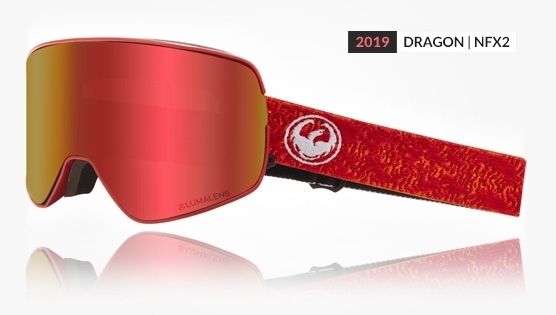 The newest edition to the Dragon NFX family, the NFX2 brings next level clarity, adaptability, and style to the Dragon lineup. Featuring rapid-fire lens change of their Swiftlock Technology, making it a most advanced cylindrical lens frame. Delivering the easiest and most secure lens change ever, the NFX2 is engineered for an airtight lens-to-frame interface and backed by Super AntiFog Technology. With lens options that include Lumalens, a colour optimized lens technology that offers ultra high-definition optics across the entire spectrum of light conditions.